Blue Water Sailing School has been introducing students to the sailing lifestyle since 1989. 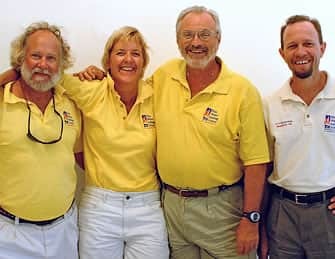 Our award-winning instructors represent over two centuries worth of combined sailing experience, and they pride themselves on a hands-on approach to education. We focus on providing both “book knowledge” and authentic, practical experience. Our fleet represents a wide variety of popular mid-range yacht types, and we’re one of the few schools that anchor at a different location every night. When you finish a Blue Water Sailing School course, you won’t just have a certification. You’ll have real-world practice that gives you the confidence and skill to set off on your own adventures at sea. You don’t have to take our word for it — read what our alumni have to say about their BWSS education, and what they’ve accomplished with the skills they learned. Take your time to look around our site, browse our course catalog, and get to know us. If our teaching approach and course offerings are a good fit for your sailing ambitions, we hope to see you in class soon! Don’t hesitate to contact us if you have any questions.